With three related meetups going, we were getting a lot of traffic and cross-pollination of members. There was also no shortage of sponsorship for food and beverages—though we were typically, BYO. Pizza is common fare for a meetup, just because it’s easy and doesn’t require too much in the way of incidentals like plasticware. 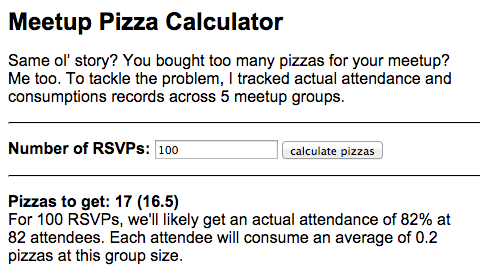 Over the next few years, I kept guessing at the number of pizzas we needed based on the number of RSVPs. Then, in weak effort to be more accurate with each order, I tracked leftovers. As a general practice, we took head counts and calculated regular percentages of attrition (RSVPs to actual attendees). The higher the RSVPs, the higher the number of drop-out attendees; we saw roughly 80% attendance in groups around 100. Inversely, if the group was small—say ten—the attendance was near 100%. The larger the group of actual attendees, the less pizza per person was consumed. Smaller groups ate a tremendous amount more pizza per person. Consumption by tenure – Regulars tend to expect food (or confirm if it exists) and thus don’t eat beforehand. Also, regulars are less shy about eating in front of their friends. No judgment for taking the extra slice. Newcomers, on the other hand, often eat ahead of time and may have a higher sense of politeness toward the group. Consumption by group size – Smaller groups can more easily survey the pizza-to-person and determine if their taking another piece is going to keep someone else from getting enough. In a larger group, many factors are at play. A person may be conservative about grabbing extra slices in case the food runs out, or because of perception. Often, this leads to attendees grabbing too few slices before the talk, then when the talk begins, not wanting to interrupt by going back for seconds. That’s not a problem for smaller groups, where eat eater may have hit the pizza multiple times before the event began. The first calculates the number of actual attendees based on RSVP count. It says if there are 10 or less RSVPs, we’ll likely get 100% attendance. Anything above 10 will be a gradient closer to 80% as your event gets larger. The second takes the number of actual attendees and calculates the number of pizzas you’ll need based on consumption averages of that group size. In tandem, they form the Meetup Pizza Calculator I’ve found to be fairly accurate—or at least much more so than guessing or assuming the false two slices per person. There’s a disclaimer on the calculator, but I’ll repeat it here. The calculator assumes a lot of constants like: working professional adults, on a weeknight, at around the same time in the evening, with average-size large pizzas, etc. We’ve observed radical numbers when the weather is particularly bad, for example.